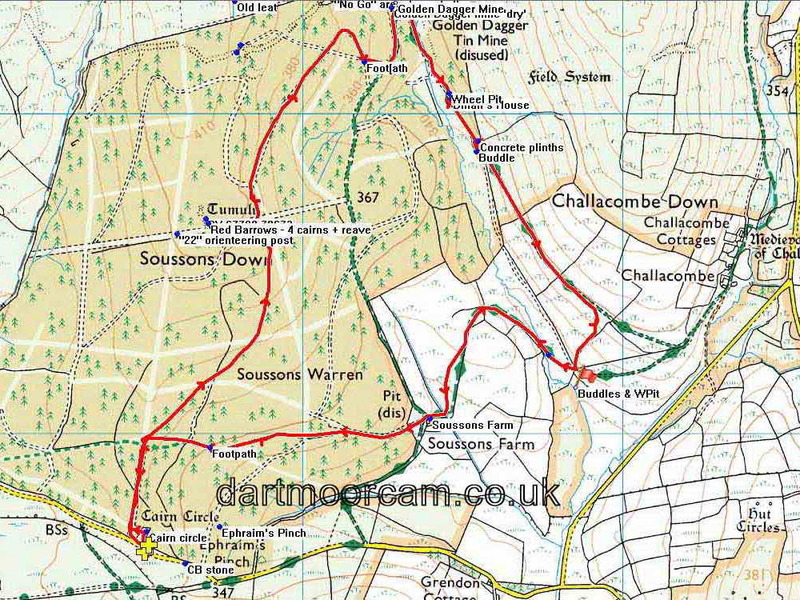 This walk: 2015-9-30. Ringaston ring cairn, Sitka spruce, common heather, deer slots, thistles, Golden Dagger Tin Mine "dry", yarrow, teasel, common mullein, Redwater Brook, wheel pit, Dinah's House, concrete plinths, buddle, bees, Konrad Lorenz, lynchets, fly agaric. Ordnance Survey, Six-inch to the mile, 1st edition - 1888-1913 - Orientation: Dinah's House is below "Aqueduct" which is below "Golden Dagger Tin Mine"
Previous walk in this area: 4th January 2012, 29th August 2012, 9th July 2014 and 17th September 2014. Image © J Butler 1991. Reproduced by kind permission (ref. 29 Sept. 2012). Forest road, verge, young crop of Sitka spruce trees with older Sitka spruce behind. A double slot, out of "register" i.e. the rear foot has not registered in-line with the front foot: this is left by a female deer which has a wider pelvis and thereby leaves wider footprints with its rear legs. Reference:Tracks, Trails and Signs, by Fred J. Speakman, 1958, Bell's Young Naturalists' Library, Robert Cunningham & Sons Ltd, Alva (from my youth!). The commonest deer around Dartmoor is probably the roe deer, although fallow deer are also seen and even red deer on occasion. Hi ho ....... I have to sometimes! A veritable sea of tall thistles along the track side. Zoomed view of the gert. The leaf - I remembered this time! The plant is growing on the wall of the building. The Redwater stream - so-called because of its colour that derives from dissolved minerals, iron, tin - the Red River, at Gwithian, Hayle, flows through old tin workings. 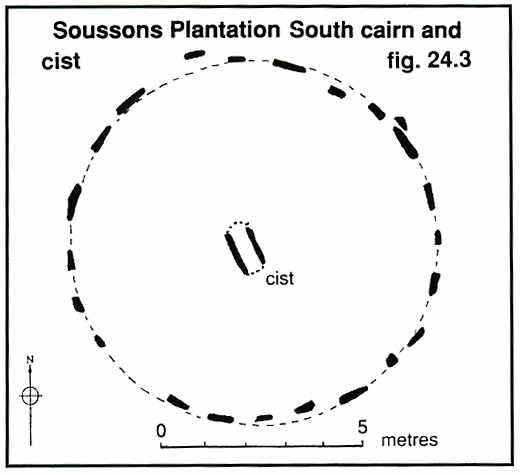 Part of an wheel pit, at SX 68459 80064. Below here were the dressing floors of the mine where the crushed ore went through various sorting procedures to "fine" out the tine ore from the dross. Overview - where a water separation process occurred to further concentrate the tin. The story of the farm's livestock. An aside - Bees - is there a "waggle" dance in progress? 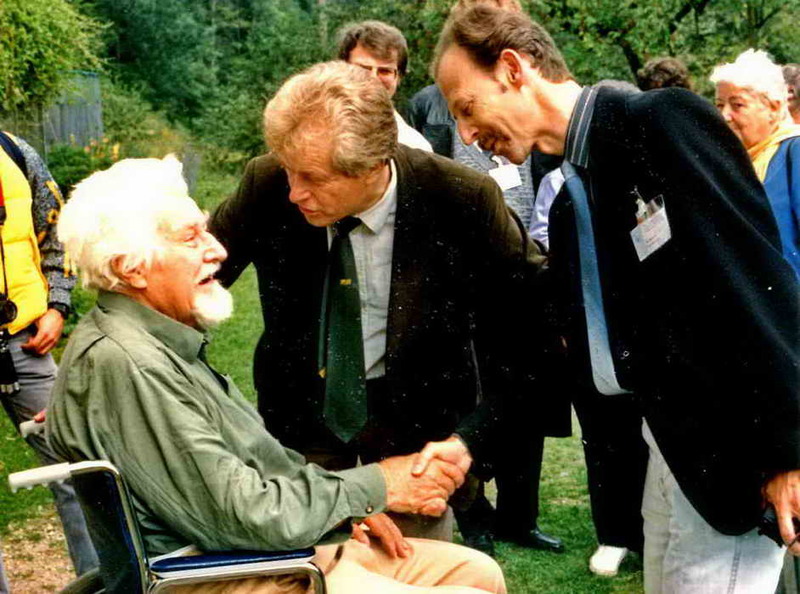 Konrad Lorenz was joint Nobel Prize winner for Physiology & Medicine in 1973 with Nikolaas Tinbergen and Karl von Fritsch after deciphering the meaning of the bees "waggle" dance. He and I spoke about Amphioxus. These photos were taken by Karin Bernatzky, our good friend and Photographer, Zoology Institute, Uni. Salzburg, while we spoke. This was during a family holiday to Austria, in 1988 (by our next holiday there, in 1990, he had died, aged 85). We were visiting the Konrad Lorenz Research Station at Grunau (part of the Konrad Lorenz Research Institute). The visit arranged by Prof. Hans Adam (Uni. Salzburg) and the Station Director, Kurt Kotrschal, both friends and visitors to the Marine Biological Association, Plymouth. Konrad was in failing health and using a wheelchair. During this visit we were told of studies on grey lag goose behaviour and our daughter remembered the "goose girl" for a long time after! 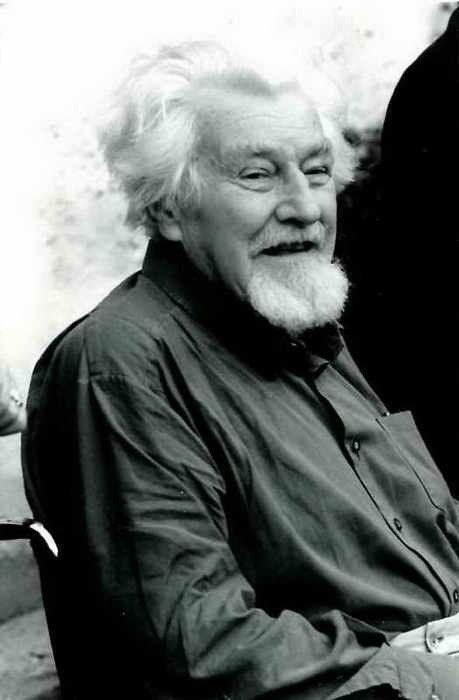 Konrad Lorenz, Nobel Prize winner (1973). Valley bottom, a clear-felled area, young and older Forestry Commission Sitka spruce trees. Fields to the west of the Redwater valley. Zoomed view of a hawthorn tree. Concrete "clapper" bridge, at SX 68768 79246. A footpath through part of the plantation - it wasn't all wide forest roads today. Distance - 6.09 km / 3.78 miles.